What we have here is a feast of assertions some people make about space that are satisfyingly incorrect, with pithy, entertaining explanations of what the true picture is. Matt Brown admits in his introduction that a lot of these incorrect facts are nitpicking - more on that in a moment - but it doesn't stop them being delightful. I particularly enjoyed the ones about animals in space and about the Moon. Just occasionally, the wording goes from ambiguous to downright misleading. So, another 'fact' that's challenged is that light from the Sun takes eight minutes to reach the Earth. There was one potential challenge, in that it's actually a little over eight minutes. But Brown uses the fact that photons can take many thousands of years to get to the surface of the Sun before taking eight minutes (and a bit) to get here. And if the statement had been 'Light takes eight minutes to get from the depths of the Sun to the Earth', he would have a point. But it didn't. Since nitpicking is the order of the day, I'd also point out that we don't know that the universe is finite, and Baa Baa Black Sheep is a variation on the theme of Twinkle Twinkle Little Star, not, as the book says, the same tune, as it has two notes that aren't in the original and several timing differences. But one of the joys of reading a book like this is looking out for things to disagree with. And it certainly is great fun to read - and a fairly quick read too. (A good thing in my book. Far took many popular science books are over-long.) Easily managed on a mid-length train journey. The content is lightly written and produces fascinating factoids throughout, though, for some reason, the second half of the content wasn't quite as interesting as the first. And, of course, as with Brown's earlier book Everything You Know About Science Is Wrong, I bridle somewhat at the title. 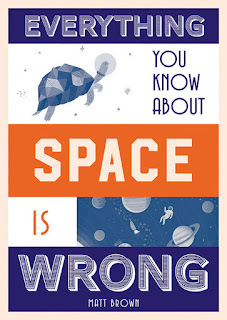 I know a reasonable amount about space, and most of it isn't wrong. But I suppose titling a book 'Things That Some People Think About Space (Not All the Same People) That Is Wrong' would be rather clumsy. Lots of fun for both younger and adult readers with an interest in space or science in general.